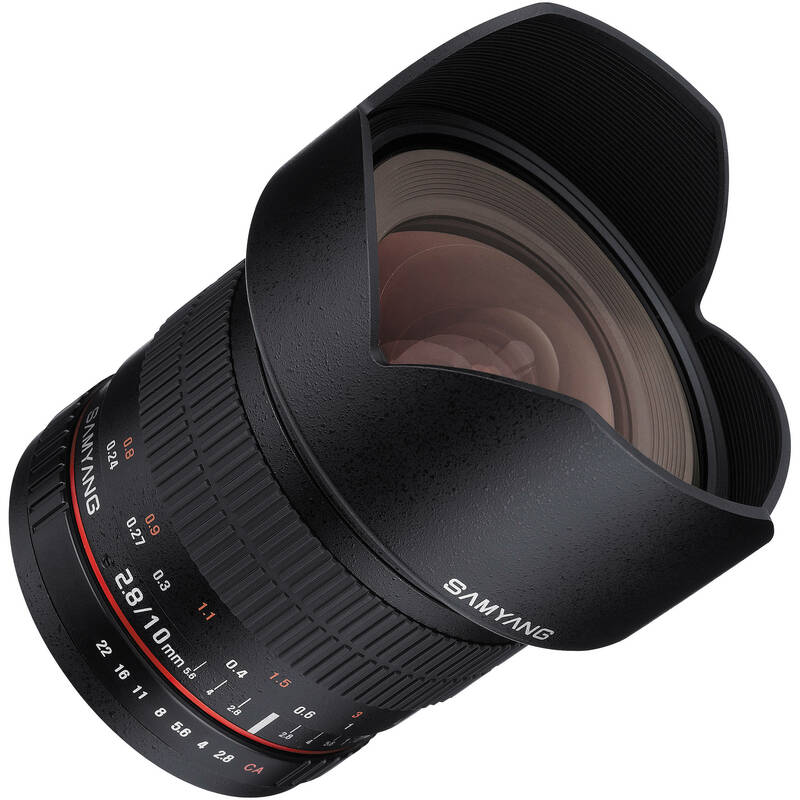 The Canon EF mount Samyang 10mm f/2.8 ED AS NCS CS Lens is a prime, manual focus wide-angle lens designed specifically for use with APS-C-sized image sensors. 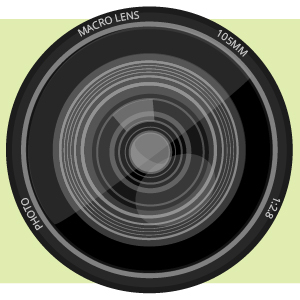 Providing a 35mm-equivalent focal length of 16mm and a broad 105.9° angle of view, this lens is ideally suited for interior, architectural, and landscape photography applications. One extra-low dispersion element and two aspherical elements have been incorporated into the optical design to minimize chromatic aberrations and distortion in order to produce sharper images. Additionally, a nano crystal anti-reflection coating system (NCS) has been applied to lens elements in order to reduce surface reflections and prevent lens flare and ghosting for improved light transmission and more contrast-rich imagery. Box Dimensions (LxWxH) 8.74 x 6.85 x 4.803"
10mm f/2.8 ED AS NCS CS Lens (Canon EF Mount) is rated 4.5 out of 5 by 2. Rated 5 out of 5 by Matteo D. from Fantastic lens Simply awesome! Excellent sharpness and low presence of CA. I use it for travel and hope to use it soon for astrophotography. The manual focus ring is smooth and it's a pleasure to focus with it. Best quality/value ratio for me. Can you tell me the difference between this and the Rokinon version... apart from the $1 price difference!I know it's a different choice of lens options, but is the image quality very different to the Tokina 11-16? I can't find a direct comparison/website that has a review of both (so would run the same tests). Rokinon is the makers' brand (ROK for Republic of Korea), Samyang is a second brand of the same maker. The image quality of both the Samyang 10mm and Tokina 11-16 are very good, though the Tokina lens will give you more versatility if you wanted to have zoom. Would that lens work well on the Canon C300 Cinema Camera ? This lens covers an APS-C/Super 35mm sensor, which the C300 has. The Samyang 10mm will work very well on the Canon C300. Hi, a question ... I hesitate between buying the Rokinon 10mm f / 2.8 ED AS NCS CS Lens for Canon EF Mount and 10mm f / 2.8 ED AS NCS CS Lens ( Canon EF Mount) by Samyang , which is the difference between these target ??? , I only see diferenciasn q is the price .... A greeting and thanks . Rokinon is the makers' brand (ROK for Republic of Korea), Samyang is a second brand of the same maker. There is no difference in the lens quality. Will this lens fit the Canon T6? Yes, the Samyang 10mm f/2.8 ED AS NCS CS Lens (Canon EF Mount) will mount onto the Canon EOS T6 DSLR camera. Do note that this is a fully manual lens, and you will have to both focus manually and set the aperture on the lens manually. As there is no electronic communication between the camera and lens, you would have to use either Av (Aperture Value/Aperture-Priority) or Manual mode to set the exposure. Specs say that it has EF mount, but it also says it's designed for APS-C sensor cameras... This doesn't make sense to me. My concern is that I have an APS-C sensor camera now, but I'm planning to upgrade to a full frame camera in the near future. Will this lens work in a full frame camera? Asked by: Juan M P.
All third-party lens manufacturers who design lenses for Canon DSLR cameras use the Canon EF lens mount which uses the red dot on the lens mount, regardless if the lens is designed for a camera that uses a full-frame sensor or a camera that uses the APS-C sensor. However, a lens designed for the Canon APS-C sensor should not be used on their full-frame cameras, regardless if the lens will physically fit. As such, while the Samyang 10mm f/2.8 ED AS NCS CS Lens uses the Canon EF Mount, it should not be used on a Canon full-frame camera. If you are looking for a lens to use on both full-frame and APS-C sensor cameras, then I would instead recommend the Samyang 14mm Ultra Wide-Angle f/2.8 IF ED UMC Lens for Canon EF Mount, B&amp;H # SA1428C, for your needs. The only thing you may want to consider is the ease of use with this lens if you were to use other micro 4/3 cameras in the future; otherwise, there aren't really any cons to getting this lens if you plan to use it with a speed booster. Will this lens create a fish eye Bulge effect? I am looking for a 10mm or 8mm super wide Prime that won't create a bulge. An example of what I mean is the Canon 10-18mm. that lens has flat glass and wont create a bulge. another example is the sigma 10-20mm. I'm curious if there are any primes that have flat glass? There is a slight barrel distortion (straight lines aren't straight) and the bulge is very slight. Its more obvious the closer you are, but if you stand 4-5ft away, its not noticeable on the center of frame. There's some test footage online, take a look! Does this lens support filters? No, mainly because you cannot remove lens hood.